The prices of Liquefied Petroleum Products or LPG will increase from midnight. From tomorrow a 4.5kg cylinder will cost $14.55, an increase of $1.66. 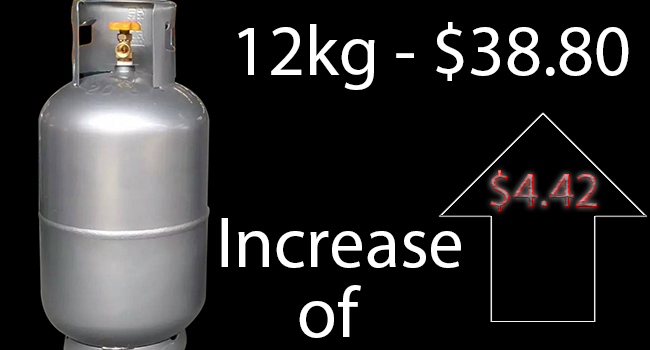 A 12kg cylinder will be $38.80, an increase of $4.42. Bulk will increase from $2.62 per kg to $2.73 per kg, an increase of 11 cents; and Auto Gas will cost $1.83 per litre, an increase of 22 cents. The Fijian Competition and Consumer Commission says the prices from December 4th to January 14th is mainly determined by the movement in the international prices and the operating cost review of the Fijian LPG Suppliers. The FCCC completed its final phase of the operating cost review and based on its independent assessment, the new prices for Cylinder, Bulk and Auto gas increases by $0.37 per kg; $0.11 per kg and 22 cents per litre respectively from tomorrow. It says the major reasons for the increase in the prices for all LPG products are from the increases in the international butane prices based on the Saudi Aramco Contract Price, affected by the strengthening of the US dollar and the increase in the international freight rates. LPG Contract Price (CP), commonly called the “Saudi CP” is the primary driver of the LPG pricing. The FCCC will conduct the next fuel and LPG price review on January 15th.